For years (many more than you might think) this “thing” called theopoetics has been happening, occuring, bubbling-up in various places, writings, and presentations. Those who have called their work by the title of theopoetics come from diverse backgrounds including Biblical criticism, death of God theology, postmodern thought, and process theology. Such a wealth of fields and interests encourages broad interest but at the the same time can result in students, practicioners, laypeople, and theopoets themselves lacking a connection to the wider body. Callid Keefe-Perry’s book, Way to Water, remedies this by mapping a path through the sundry strands of theopoetics past and present, all the while working to demonstrate just what theopoetics is or aims to be. Callid skillfully summarizes the positions of early theopoetic thinkers Stanley Hopper, Amos Wilder, and Rubem Alves before moving in subsequent chapters to more contemporary versions of theopoetic thought. He works his way through the contributions of Melanie Duguid-May and Scott Holland, process theologians Roland Faber and Catherine Keller, radical theologians Peter Rollins and John Caputo, and the work of Richard Kearney and Karmen MacKendrick. As the title suggests, Callid provides a path on the journey toward theopoetics (or a theopoetic) by gathering together some theopoetic events, examining their moments of resonance and pointing out their places of dissonance. He is careful not to coorindate theopoetic “schools” into fixed positions in relation to each other, which would be antithetical to the theopoetic project in general, but rather he treats the various thinkers/writers as bodies that might collid, slip over each other or dance together in the on-going effort to name and describe that which we call God. Additionally, and importantly, the last two chapters of Way to Water indicate practical applications of theopoetics for churches and pastors. I would expect nothing less from a practical theologian, and again Callid proves wonderfully adept at parsing out how an embodied theopoetics might (and does) take shape through preaching, pastoral care, and liturgy. Since Callid is well aware that there can be no conclusion to the infinite movement of divine rhythms, for me the end of the book unfolded into new beginnings in two significant ways. First, Callid suggests three definitions for the term theopoetics, each textured by what Callid has gleaned from the theologians he addresses in the book. These definitions struck me as deeply personal and intimately situated in various ways, which I believe only further demonstrates an important point Callid makes in the book: the symbolic, prerational, and sensuous modes of theological discourse are not to be ignored. Second, and very much related to the definitions he offers, Callid’s epilogue consists of a series of aphorisms intended not just to describe theopoetic work, but to actually be theopoetic writing. Here he shows us through stories and poems that, while not entirely elusive, the divine is not within our grasp, cannot be pinned down. Rather the aphorisms open the reader to the continual progression, the unfolding process of naming God, of articulating our relationship to the divine. 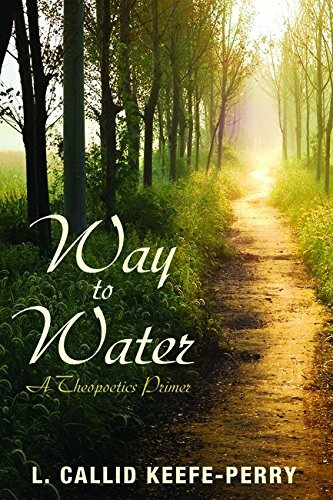 Way to Water provides a helpful text for those teaching or studying theopoetics for the first time, and it is accessible to non-academic readers as well. I highly recommend this book to all my pastor-type friends, as I know it will spark conversation among you and in your churches. I also recommend it my friends who might consider teaching a course on theopoetics and taking up the task of training the next generation of theopoetic thinkers. Just a couple of my cravings Create a free website or blog at WordPress.com.